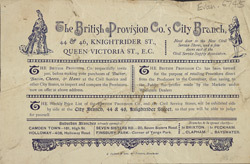 The British Provision Company was a co-operative established and managed by food producers to sell their wares direct to the public. This advertisement notes that buying at their stores would save the public "the profits made by the Markets and Wholesale Dealers." From the co-operative's point of view, it would save them the transport and entry costs to such markets.